Hunyady Appraisal Services is regarded as one of the leaders in providing appraisals for the construction, mining, and transportation industries. We provide contractors, financial institutions and manufacturers with valuations for making decisions regarding purchasing, collateral financing and corporate acquisitions. Over the past 28 years, whether it was highway construction in Turkey, underground mining equipment in Australia or a pipeline project in Alaska, we have built our reputation for helping our clients meet their appraisal needs. Our staff’s extensive knowledge and insight into the machinery and equipment markets represents over 120 years of experience. Hunyady has performed inspections in all 50 states, Mexico, Canada, Nigeria, and the Caribbean. Hunyady provides all forms of appraisal documents from complete on-site physical inspections to non-inspection valuations. Our strict adherence to ethical appraisal standards coupled with a strong “get the job done” attitude has earned Hunyady a reputation for producing accurate valuations that can be relied upon when making business and financial decisions. Hunyady can provide all forms of appraisal reports including complete physical inspections, non-inspection valuations, projected residuals, retrospective valuations and product matrixes. Reports can be provided in any format with digital photographs that can be transferred electronically. Our appraisers’ staff has reached the highest levels of certification and accreditation membership through American Society of Appraisers and Equipment Appraisers Association of North America. All appraisals conform to current Uniform Standards of Professional Appraisal Practices as set forth by The Appraisal Foundation. From inside the Arctic Circle to the rain forests of Ecuador, Hunyady has been there. 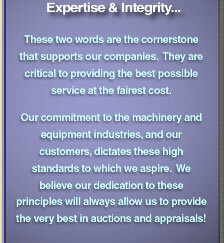 We have the experience, knowledge and “can do” attitude that produces appraisal reports you can rely on.